Raaga.com: Mohd.Rafi Thuje Na Bhula Paayenge…! Mohd.Rafi Thuje Na Bhula Paayenge…! It was 31 July, 1980, when Mohd Rafi, the versatile playback singer sung these lines for music director Laxmikant-Pyarelal for the film AAS -PAAS and bid adieu, never to come back! For that evening at 10:50 pm Rafi Sabha suffered a massive heart attack and died. True indeed because there is not a single day when we do not listen his songs and sing along with him. 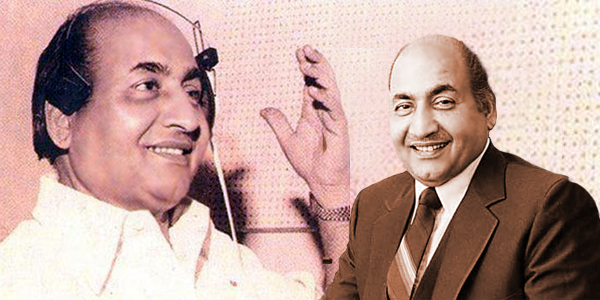 Mohammad Rafi was a true legend of Hindi Film Industry. He kept the world captivated with his versatile singing for four decades. Be it Indian classical, Ghazal, Disco number Rafi had the amazing ability to sing any verity with same versatility. Remember the classically numbers like O duniya ke rakhwale … Man tadpath hari darshan ko… (BAIJU BAWARA) or the foot tapping romantic masterpieces Teri Pyari Pyari Soorat Ko…. (SASURAL), Baharon Phool Barsao…. (SURAJ) or tragic numbers like Dil Ke Jharokhe Mein… (BRAMACHARI), jaane vaalon zara, mud ke dekho ..(DOSTI) or fulfilled Yahoo! Chahe Koi Mujhe Junglee Kahe …(JUNGLEE), Sar Jo Tera Chakraye…(PYASSA) Rafi could sing all. His contribution to the Hindi film industry has been fabulous and perhaps no singer till date has managed to capture the hearts of fans the way Mohd. Rafi did. On his 35th death anniversary Raaga.Com pays our homage to Mohd. Rafi and remember him with the song….